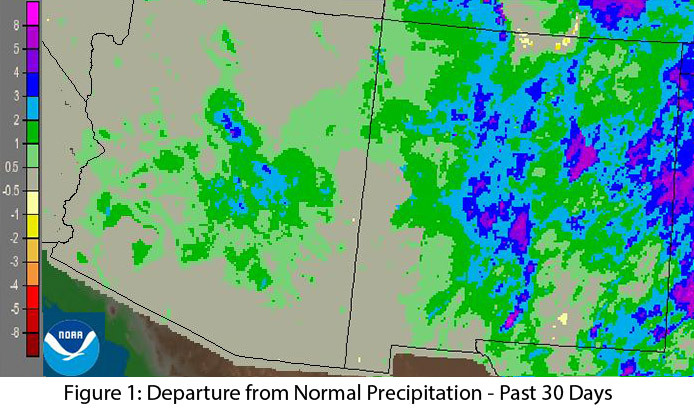 Precipitation: In the past 30 days, most of New Mexico and much of central Arizona recorded well above-average precipitation (Fig. 1). Climatologically, this is one of the drier times of year for the Southwest, so any substantive precipitation during this timeframe is generally unexpected but welcome, as it helps tamp down fire risk. Water year observations since October 1 demonstrate the persistent and ongoing drought, with most western states, including Arizona, recording large areas of below-average to well below-average precipitation (Fig. 2). 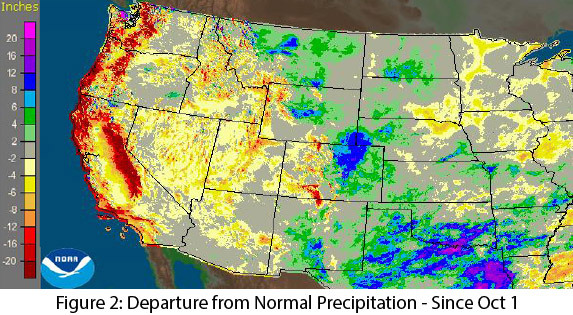 New Mexico and the eastern side of Colorado, Wyoming, and Montana have benefitted from some late season storms, but that rainfall on the other side of the Continental Divide, does not necessarily help the water situation in the Southwest. 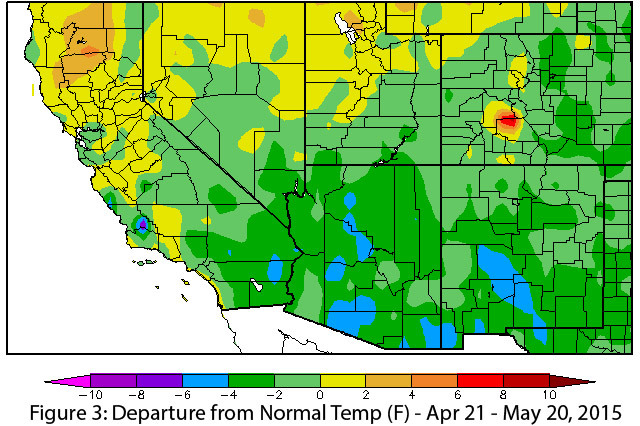 Temperature: Lingering storms and above-average humidity contributed to mild and pleasant conditions across the Southwest, with temperature anomalies in Arizona and New Mexico between 2 and 6 degrees below average across the region in the past 30 days (Fig. 3). This counters more than six months of record or near-record warm average temperatures that have persisted in the Southwest and the western U.S. since the water year began on October 1 (Fig. 4). 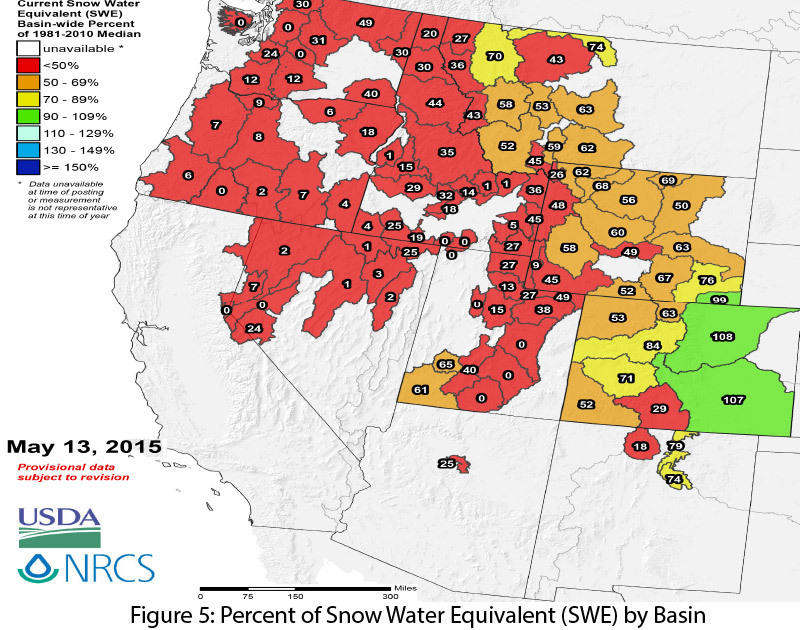 Snowpack & Streamflow Forecasts: The late-season push for cooler than average weather had little impact on snowpack, and as of May 13, snow water equivalent (SWE) was far below average across the western U.S. (Fig. 5). 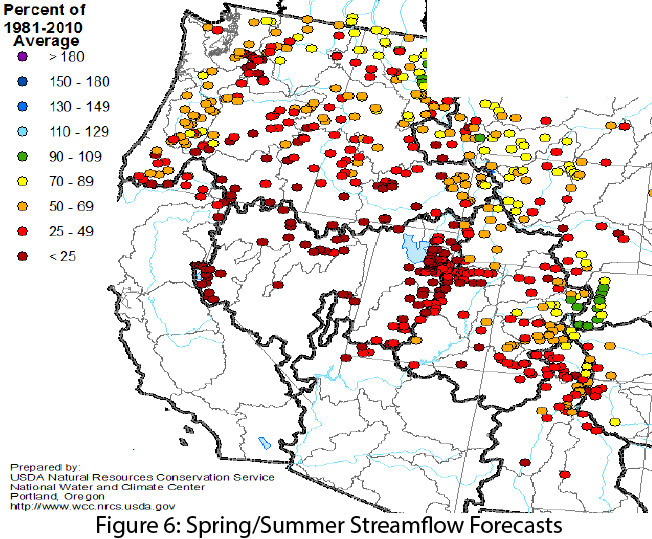 Above-average temperatures and below-average precipitation, both contributing to a meager snowpack, were primary drivers in this pattern and resulted in below-average forecasts for streamflow (Fig. 6). Drought & Water Supply: The U.S. Drought Monitor highlights persistent drought conditions across the West, with particularly severe conditions in California and Nevada, and emphasizes primarily long-term drought conditions across most of Arizona and much of New Mexico. Total reservoir storage was 44 percent in Arizona and 26 percent in New Mexico (see reservoir storage for details). Below-average snowpack and above-average temperatures have resulted in earlier-than-normal melt-out in numerous areas and losses associated with sublimation and infiltration. Wildfire: Mild spring weather, above-average precipitation, and relative humidity have resulted in reduced wildfire risk in Arizona and New Mexico so far this season. This can change quickly, especially since precipitation during the 2014 tropical storm season contributed to abundant fine fuels, which can escalate wildfire risk when the region eventually dries out. An early or even on-time start to the monsoon could limit the window of highest wildfire risk, but a delayed start could extend it, especially given the dry lightning associated with summer storms. Precipitation & Temperature Forecasts: The May 21 NOAA-Climate Prediction Center seasonal outlook predicts above-average precipitation this spring into summer for much of the Southwest and Intermountain West, although California and most of Arizona are notable exceptions. Temperature forecasts remain split across the region, with elevated chances for above-average temperatures along the West Coast and eastward into Arizona (and most of the western U.S.), and increased chances for below-average temperatures in western Texas and into eastern New Mexico. 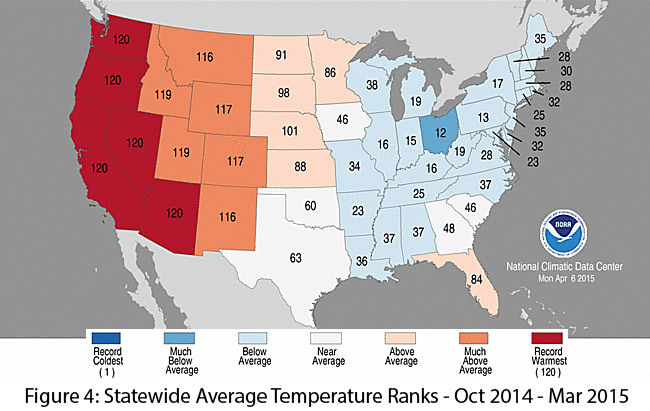 Copyright © 2014 Climate Assessment for the Southwest, All rights reserved.